Safe phosphorescent/phospholuminescent materials which give off a soft and safe greenish glow. Non-radioactive and composed of thin layers of vinyl material impregnated with phospholuminescent materials working on the principle of light-absorption, and re-radiation. These materials have a long history in experimental physics and life-energy studies, as a tool for darkroom observations of natural energy scintillations. Once used before the invention of electronic detectors, as an aid in visual observation of "cosmic rays", the materials are also used to observe undulations and movements of atmospheric life energy, and energy-fields. We offer self-adhesive sheets of this material, measuring one foot square, and also as small rolls of self-adhesive "glow tape". Simply cut to the size you want, then peel off the protective backing and adhere to whatever surface you wish. An experimental protocol for "Visualizing the Orgone Energy in a Darkroom" using this material is also given below. Small Glow-Tape Reel measuring 0.5" width by 4' (48") length. Full sheets of glow-in-the-dark material measuring 12"x 12" square. It can be used as-is, stuck to a wall or metal plate, or easily cut into long strips with scissors or a paper-cutter following the observational protocol given below. Several sheets can also be assembled together to make an entire "glowing wall" for visualization of the human energy field. The following describes a simple experiment to observe orgone energy in a darkroom. We routinely make this demonstration to students and professional visitors to our laboratory, inside the Orgone Energy Darkroom. But an orgone energy darkroom is not necessary. An ordinary darkened room will do, if care is taken. The experimenter should firstly read Wilhelm Reich's accounts of this phenomenon as given in his book The Cancer Biopathy which is available from our bookstore and from libraries. * Steel sheet metal measuring 1 foot square, or 1 x 2 foot, about 26 gauge galvanized steel. * One or more reels of 0.5" width glow tape, or one reel of 1" width glow tape. * A small quantity of standard heavy duct tape. Firstly, by our information this glow-in-the-dark material does not appear to have any "lifetime", so long as you put it where it will not be physically damaged. It should retain the ability to absorb light and then glow in the dark almost forever, though expect the viny material to begin degrading over time if you expose the material to sunlight or moisture. To use this glow material to help observe the moving orgone in a darkroom, you firstly must secure a darkroom! A closet would do, but better to have some enclosed space where there is air ventillation, as you will need to sit there for upwards of 30 minutes or more, and all light as from windows must be closed off. This can be done in both daytime or nighttime, though daytime is more demanding to seal off windows and other stray light sources. Even at night, stray light creeping under doors or in chinks of windows from city lights or other parts of your home might be sufficient to overwhelm the effect, so firstly getting a really dark room is important. Set it up with a comfortable chair as you will need to sit in this dark environment for maybe 20-30 minutes, to allow your eyes to "dark adjust". Once you have found such a dark room and sat in it to adjust your eyes, even with a tiny, tiny amount of light creeping in, many people observe the orgone energy quite spontaneously. It appears as a slowly moving dull-grey fog or as tiny moving points of light. If you observe this phenomenon against a checkerboard or pin-stripe background of high contrast, such as alternating patterns of black and white, it helps enhance the effect. Our glow-tapes and sheets are used to enhance this natural effect even moreso. Using the glow tapes, you can make an "array" of parallel strips of tape separated about the same width of the tape, and lay them out on a flat piece of metal (the metal also enhances the orgone energy effects). Get a sheet of metal perhaps 1' square, standard 26 or 28 gauge galvanized steel as from a sheet-metal shop will do. Wash it clean of oils and allow to dry. It helps to add a strip of duct tape along the metal edges, to prevent cutting your hands during handling. From one package of the 0.5" x 48" glow tape, you can make 6 strips of tape 8" in length. Lay the strips out near the center of the metal plate in parallel rows separated by around 0.5 inch. 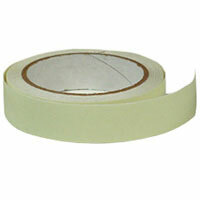 You will then have an array of the tape strips separated by equal widths without the tape. You can make an array to nearly fill the sheet metal piece by using more of the tape strips. The tape measuring 1" width is more economical, but to do the job right, it might be necessary to cut it down with scissors to the 0.5" width. A larger metal sheet measuring 1' x 2' is even better, but obviously requires more tape. At our lab, we have several of 1 x 2 foot metal sheets prepared like this, using 1.5- or 2-foot strips of the tape, and the effects are quite spectacular as enhanced inside our orgone energy darkroom. Similar effects are possible in an ordinary darkroom, but if you have an orgone energy accumulator or orgone blanket, you can place that near to the metal sheet with the tape to also enhance the effect. The large sheets of glow material can also be used for this same purpose, and you can then lay opaque shadowing materials on top of it, to yield up similar high-contrast patterns. It is useful for a variety of experimental purposes. Just prior to running your visualization experiment, expose the metal sheet and tape strips to an ordinary houselamp or strong flashlight beam. Then take it into the darkroom and settle down. Almost immediately, you will observe the tape glowing brightly in the dark room, such that you can see around the room without any other source of light. This will become more apparent as your eyes adjust to the dark. Eventually, the glow tape will start to lose its energy, and the glow will start to dim. At this point, you will observe more and more movement around the glow tape, and the entire room will fill with motion that previously was not apparent to you. When the glow tape is very dim, and the metal sheet with the array held off at around 3 foot distance (one meter) you will see a tremendous agitation and motion of the energy, moving between the dark and lighter areas of the tape array. It is a motion which occurrs just above the tape array, not "in the tape", which you can confirm by looking at the array held flat to your line of vision. The movement jumps off the metal sheet, and towards it, being made visible by the dull light of the glowing tape. At this point, you can also use a magnifying glass to verify that the phenomenon can be magnified -- this proves it is "out there" and not some optical illusion. Best to use a large diameter magnifying glass where both eyes can be used at once. Using the larger glow sheets, you can also cut them into strips, or any shape you wish, to reproduce the above observations, or just use the glow sheet without modification. You can also assemble several glow sheets into a large array -- for example ten or twelve such sheets, organized to make an array measuring 3 foot-squares horizontally and 4 foot-squares vertically, will virtually cover a large section of wall. The material can then be activated with a strong light, and then a person can stand in front of the glowing material as it slowly dissipates, to visualize the human energy field. This can also be done with even one of the squares, to visualize the field around a hand or smaller object, but it becomes more dramatic with the larger array of material. At OBRL we are today experimenting with specialized very low-light videocameras to document these interesting phenomenon.